Map No. 3 From the Humboldt Mountains to the Mud Lakes, from Explorations and Surveys made under the direction of the Hon. Jefferson Davis Secretary of War by Capt. E. G. Beckwith 3rd Artillery F. W. Egloffstein Topographer for the Route 1855. This is a rare and important 1855 map of parts of Nevada prepared for the Pacific Railroad Survey. 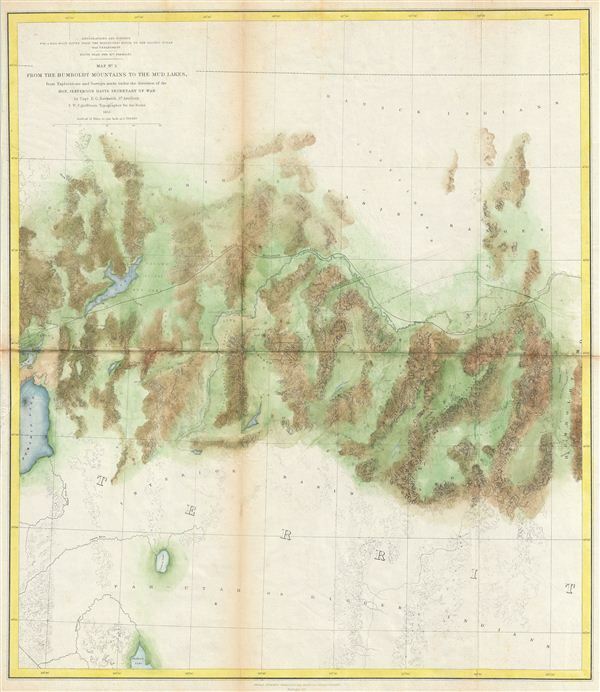 This map covers from the Humboldt Mountains (West Humboldt Range), at the western end of the Great Basin, westward was far as Pyramid Lake and the Mud Lakes. Offers superb topographical detail – most attributable to the expedition topographer F. W. egloffstein. This is the third of a series of four maps drawn and surveyed By Captain e. G. Beckwith with the intention of determining the best route for a railroad from the Mississippi to the Pacific. The route suggested here follows the Humboldt River through the West Humboldt Range before turning southwest to pass between Mud Lake and Mud Lake Peak. Prepared under the direction of Secretary of War Jefferson Davis (future president of the Confederacy) by Captain e. G. Beckwtih and F. W. egloffstein. engraved by Selmar Siebert in Washington D.C.
Reports of Explorations and Surveys, to Ascertain the Most Practicable and Economical Route for a Railroad From the Mississippi River to the Pacific Ocean. Made Under the Direction of the Secretary of War, In 1853-56, According to Acts of Congress of March 3, 1853, May 31, 1854, and August 5, 1854. Volume XI. Washington: George W. Bowman, Printer. 1861. 36th Congress, 2d Session, Senate, Ex. Doc. (Washington) 1855. Rumsey 0693.030. Wheat, C., The Mapping of the Transmississippi West, 1540-1861, #825.